The FT.com is a financial-industry focused news agency with a reputation for quality journalism. This shines through in the way they support innovation in their development teams. Peter Chittum and I were lucky enough to be invited along by the Financial Times Force.com team to see this in action. The FT.com hackday included teams from several of the companies technology groups, all of whom came up with a wallboard of ideas. The Force.com team aka “The Benny Offs”, were tackling the challenge of a an app that would look for articles on the public FT.com search API and automatically generate Chatter feed notifications when those articles appeared. On the first day of the hack, the challenge was to understand the FT.com article search system and how best to pull the necessary information into a format that could be consumed. They were so involved in their work that then ended up hacking away till 10pm the first day. The late night didn’t stop them from being there bright an early on the second day to continue the hack. In the run up to the hackathon, several personas were identified that were meaningful in the context of the FT.com. These included student, journalist and others based on readership categories. The teams taking part in the event brainstormed ideas around one or more of these personas and put there final idea on a shared board. This is a great way to prep for a hackathon as it gives the team a clear vision of who they are building their app for. During the hack it helped them get into the head of that person and discuss things from a common point of view. That brought focus and enabled the team to move quickly, as they had less than 32 hours after all. During the hack the team sent out links to the website to a community of users at the FT.com who were following the progress of the teams. This was a great way to get fast feedback from people who would use the app every day. There were lots of positive comments that spurred the Force.com team on. The team used the FT.com search API at https://developer.ft.com/ which is designed to give full, flexible access to the broad range of content published by the Financial Times. This API was new to the team, hence the investment right at the start of the hack to get a grip on it. In the manager org, data from the FT.com public api is pulled down every hour giving a large enough data set to find articles they want to post to chatter. An hour duration was chosen as it was known that the FT.com website publishes at least one new article every hour. That data pulled in from the FT.com is then filtered down using Apex code into json format. The main challenge here was filtering out all the information they didnt want, as the querying of the FT.com API brought back a lot of data. After some great work by the team they had a working app within their developer org. 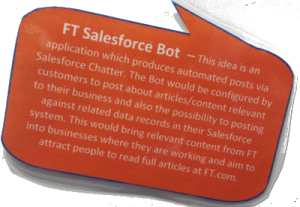 In the FT Chatter News org the FT Chat Bot posted relevant articles to chatter, based on the accounts already held in the org. Each article is linked back to the account held in the org and when you click on the company name it takes you to their page, showing you all the chatter posts related to that company. To work around the mandatory IP whitelist restrictions in Force.com the team use the solution created by Ray Delher to enble them to work within a given IP range. To understand this issue further you should read the Salesforce security guidelines. As part of the hackathon each team had to create a video and a 4 minute presentation of their app. Here is that great video which the Force.com team came up with. There were only a few prizes for the 21 teams to compete for and the competition was fierce. The Force.com team was up against big data visualisation apps, voice activated article searching, HTML5 ebooks and an app to read FT.com via the command line! With all that competition and more they still managed to win the best engagement prize. Congratulations! Why not join in one of the many hackathons and hack days that run around the world, like HackTheTower in London. Check the DeveloperForce calendar, Meetup.com and Google to find a local hackathon in your area. Alternatively, run a hackathon within your own organisation, its really easy to do. Leverage the Cloud, you make it to the sky, and then you can reach the stars! The age old debate of good design.